And people are actually buying them. Buying in bulk can save you the big bucks. 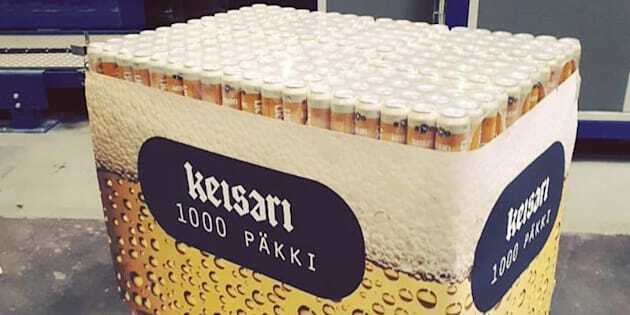 Finland's Nokia Brewery has one-upped beer producers around the globe by selling their Keisari Lager in packs of 1000. The over-sized beer cases are currently available at selected Finnish supermarkets for the small sum of 3160 Aussie dollars. That translates to roughly $2.70 per can, so it's actually a pretty good deal. The sheer size of the packs begs the question, how on earth do shoppers transport the 1000 cans from the supermarket to their homes? This is absolutely no problem for the Finnish, who are well accustomed to lifting contests and beer drinking. The country is home to the annual Wife-Carrying Contest, which sees a man carry a female team-mate through an obstacle course, hoping to be the fastest of the competitors to do so. So why not put this strength to a more practical use and carry 1000 canned beers home? No wonder the product weight wasn't a major concern for the Nokia Brewery. The super-sized packs will be in supermarkets until Monday. Come Tuesday, they will be divided up and sold in smaller packages.